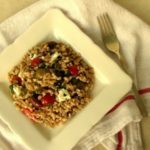 A salad made with farro, feta cheese, Greek olives, grape tomatoes, fresh herbs, and a red wine vinaigrette. Rinse the farro and place it and the salt in a 3-quart saucepan. Cover the farro with 2 to 3 inches of water. Bring to a boil over high heat. Reduce heat to low, cover, and simmer until tender (about 30 minutes). Drain and set aside to cool to room temperature. In a large bowl, add farro, feta, olives, tomatoes, rosemary, thyme, parsley, pepper, and 1/2 cup red wine vinaigrette. Stir gently to combine. Add additional vinaigrette if desired. (Vinaigrette recipe makes 1 cup). In a blender, add mustard, honey, garlic, shallot, salt, pepper, and red wine vinegar. Blend/liquify ingredients. With the blender on low, slowly pour in the olive oil and blend until combined.